An alternate title to this blog post could have been 'fun with scraps'. This is a wall hanging quilt and I just started building it up doing just a little bit everyday until I was satisfied with the result. I hoard the tiny pieces of solids because it can be useful for applique so I had much to choose from. 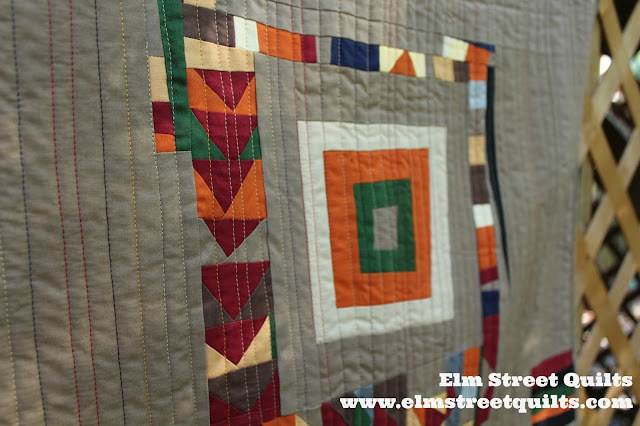 To quilt, I used different contrasting colors and did straight lines at various widths and various 'straightness'. I love, love the way this turned out. Have you made an improv quilt? I'll be linking up with Main Crush Mondays, Sew Cute Tuesdays, , Freemotion by the River, WIP Wednesday's, Let's Bee Social, Midweek Makers. Fabric Frenzy Friday, Finish it Up Friday and Finished or Not Friday. This is wonderful! I love it! My improv has been limited to pot holders. It's fun to do and one day I am going to do something bigger. This is beautiful! The different thread colors works perfectly with the solids. I love the scrappy/improv...I just love improv! I actually just finished a mini myself. I love the layout here. There's so much interest for the eye. Great job! LOL at your opening line! Mainly because I struggle with naming quilts. I've done a scrap improv, with so-so success. I think my style is more organized improv! I love organic quilts like this. I like your use of white (tan?) space. 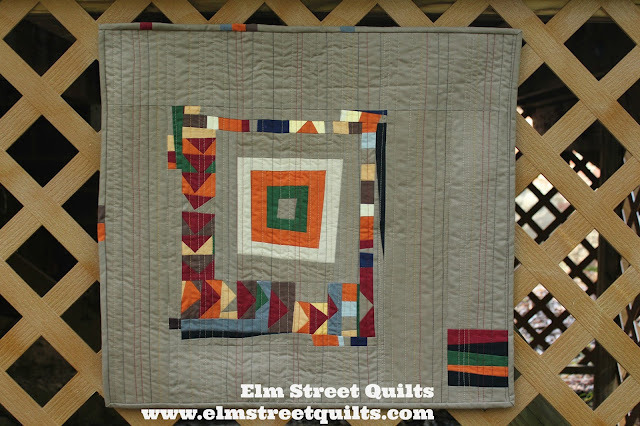 That's something I need to work on - if I tried something like this it would be a much smaller quilt because I just couldn't let that little square on the right hang out there like that. But I love that you did. I've never done improv, but I sure could be inspired by you! Love it, Lorna! Improv is my favorite type of quilting and I adore your quilt! Your improv looks so cool...love it! Improv quilting is starting to call my name, so I am going to make it something new to try in 2017! Your little quilt turned out great! I have been an improv piecer/quilter for more than 5 years using everything from cottons to denim to t-shirts to linen in my quilts. The sizes have varied from a wall hanging to a queen sized quilt. Love it. I like how you put a splash of colour in the bottom left corner which adds balance, and I like the flashes in the binding too. I haven't done much improv, I always mean to do more then another quilt pattern shouts 'make me! me next', and the merry go round starts again. Looks great, you've had fun! I love improv quilts, both making them and admiring them. Very fun. I love the little block of color off in the corner.